What would you do if, due to a government urban renewal agenda, you have to dig up a buried relative from its resting place? It so happens that that is the reality that families in Oke Ijehun area of Abeokuta (in Ogun State) are facing this moment. 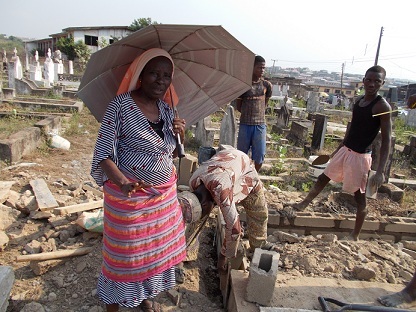 Residents have more or less a two-week window to open the graves of their long-dead relatives buried in the local cemetery, by Mortuary Junction (Off Moshood Abiola Way), and re-bury them elsewhere so as to give way to a road expansion project. So far, some families have already completed the process, relocating the decomposed remains of their loved ones to spots a couple of metres inwards from the main road. A tractor has already crushed parts of a first row of vaults, some of which already open and emptied, are strewn with bone fragments, clinical gloves and masks. The casket bearing Timilehin father’s remains had largely decomposed, so it was left in the grave and covered with broken block fragments. 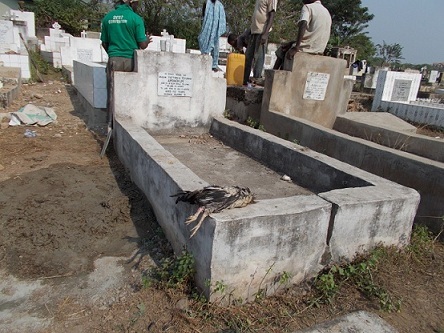 A pair of bricklayers put finishing touches to the work of re-sealing work the substitute grave, which contains Timilehin’s late mother, buried in 2003 but on a spot far removed from the soon-to-be-built highway, so it is unaffected by the relocation notice. “If you were here earlier in the day, you would have seen many people at work all over the place,” he says, the grey stubs on his face wet with sweat. Indeed, a picture published on the cover page of The Sun newspaper on the day I visit shows a couple of men wearing dust-masks and lab coats standing over some graves as motorists and passers-by look on in amazement. Further to the right, a group of young boys in their twenties are busy renovating an old grave, which is clearly unaffected by the evacuation notice. Next to where they are working, however, a man buried five years ago, in 2008, has just been re-interred. His widow, comfort, a retired business woman in her sixties stands nearby, holding an umbrella above her head. I ask to know if she feels angry or dissatisfied with her having to re-bury her late husband. Rather than being bitter, most of the families affected by this grave-digging sessions praise the current government efforts at physically developing the state. About the author: Awofeso is a recent winner of the CNN/Multichoice African Journalists Awards (tourism category). He has published three travel books about his various travels across Nigeria. He lives in Lagos, SW Nigeria.